As I’ve said previously I wanted any new site for Avalanche to be radically different from what we had done before. I had a couple of enquiries from folk seriously looking at creating a venue, cafe, bar and potentially a record shop from scratch but even if they went ahead it would be some time in the future. Rather than try to create something as we had done in the Grassmarket it made sense to move into a ready made environment. It is not uncommon now for record shops to be given space in a larger building be that cafe or arts centre but the problem is understandably they are often stuck in the basement or at the back. What we have been offered by Cabaret Voltaire is the prime space at the front. The trade off of course is that the space will need to be flexible but it is perfect for our needs. It has become obvious from doing the stalls that when we have three tables with seven racks/boxes on each that that is just about as much as people are happy to look through. It is still an awful lot of vinyl ! If I could just add in a couple of CD racks and find some space for posters then that would just about be my optimum space. 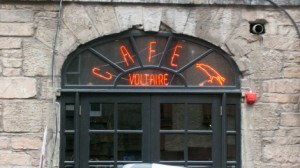 So with Cafe Voltaire I have just that with the ability to change things as I see fit. It is as central as I could have hoped for so Avalanche’s many overseas visitors will find us easily and if we want to have a big poster sale or put out a lot more vinyl we can just take over all the space on a suitable day. Instores of course not a problem ! It is just the base I was looking for and I will be able to pursue other projects I have been offered at the same time without the pressures of the rents and rates of the Grassmarket. This is not a pop-up shop. We will be open by the middle of May to coincide with the cafe’s new opening hours and we are committed to October when we will all assess how things are working for both sides. I’ll continue to look at other ideas that we may also pursue but so long as this works I’ll be happy to stay.